1 - Make sure you have been around a bit. People that are going to stick around, post and be a good representation. 2 - Have some pics of your car. A list of mods etc. Then start a thread with it. 3 - PM someone in µ and show an interest. As long as it takes for two existing members to sponsor you for membership, really. There's no set time limit, but obviously the longer you're around and the more you post, the more likely it is that you'll be sponsored and voted in. If you're denied, it's up to your sponsors to go for the re-vote. Must be "sponsored" by two (2) existing ? members. Submit a prospective membership profile, patterned after ? profile format. Must gain a 2/3 majority "yes" vote, and no more than two (2) "no" votes. Polls last for two (2) weeks, or when aforementioned requirement for 2/3 majority "yes" votes has been met, or more than two (2) "no" votes have been cast, whichever comes first. Two (2) consecutive "no" poll results will require a one (1) month waiting period before another poll can be taken. Must agree to ? membership maintenance terms. This might sound dumb....but do you need to own a mini to be a member? I understand why melissa is a member...she ordered her and its on its way. But I'm too poor to afford a mini and have to stick with my 4runner. I won't be offended if i can't be a member. Last edited by Flowremix; 09-01-2011 at 03:04 AM..
For now, it's all MINIs, but if you have a tuned compact of some sort, I'm sure we'll look to getting you on in the future if you're around long enough. Sorry, 4Runner and any other SUV doesn't count. Last edited by Flowremix; 09-01-2011 at 03:05 AM..
Ehh, if you're an existing member, getting something other than a MINI doesn't necessarily mean you're out. Doesn't say that anywhere in the rules, and we specifically chose "motoring|underground" as the name because it isn't necessarily MINI-specific. I trust that if konky is willing to give up a mini for it....we would all approve of the car. Werd to that. 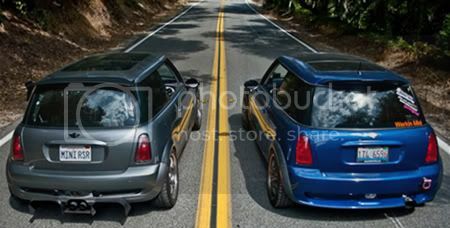 I thought about trading my MINI in for a Laguna Seca Blue M Coupe (w/ S54 (320hp) inline-6) a long time ago. Hoo man, that would have been so hot. It was perfect. I couldn't bear to part with ol' Spike, though. My buddy in my local car club is suppose to buy it today. There is a 2001 Carbon Black/Black leather S54 with sport suspension only 14k miles, garage kept, 1 owner, for sale in the paper today too... but way to expensive. I hear they oversteer like crazy, but I'm sure that could be resolved with some minor adjustments.